On Saturday, I left early for a train ride to Thornaby where I was to meet MadPriest and Mrs MadPriest for a drive through the North Yorkshire Moors and a visit to Rievaulx Abbey. I was on time and on the right train, and all seemed to be well. The countryside begins to run together in my mind, and I have no vivid memory of what I passed through on this train trip. We reached Thornaby, and a man and I got up to get off the train. As we arrived at the station, the doors did not open. The two of us frantically pushed the button to open the door, but it did not open, and the train began moving again. I saw a conductor in the next car and called him to us and told him what happened. He said, "Oh, don't worry about it. In five minutes, we'll be in Scarborough, and you can get on a train and be back here in ten minutes." I said, "What about my friends who are meeting me in Thornaby?" I gave him MadPriest's name, and he called the station in Thornaby for someone to try to find him and tell him what had happened. A woman who worked in the station in Thornaby ran out to find MP, and they were just backing out of their parking place when she caught them and told them that an American lady was on her way back from Scarborough to meet them. We almost missed each other. Had we done so, I would have got back on the train and returned to Leeds. I finally met up with MadPriest and Mrs MadPriest, who is a lovely and gracious lady. Spouses of bloggers have a right to privacy and beyond saying that both MP and Mrs MP were unfailingly kind and hospitable, I won't say more about Mrs MP. I met the border collies, Callum, Glenna, and Delphi. Delphi Glenna is MP's dog, and she seemed not to like me. Glenna Delphi is a silky beauty and was quite friendly. Poor Callum is old and stiff, like me, and he let me pet him, but he seemed to want to be left in peace. I asked my friends to stop at a village for me to change money, because all my English money was in the wallet that was lost the previous day, and I needed operating money. We did, and MP and I got out and walked around searching for the Post Office. I believe we went twice around the square without finding it. MP planted me in a spot and said, "Don't move," and went to look again. Was he afraid that I would get lost? Me? In the meantime, an elderly lady walked by, and moving only my lips, not my feet, I asked her where the post office was. She kindly told me that it was in the Co-op. MP returned from another fruitless search for the PO, and I asked the lady to tell him what she had told me. We went to the Co-op, and I changed my money, and off we went. Later, I asked MP how long he would have searched before he asked someone, and he said that eventually he would have asked. My thought is sooner, rather than later. 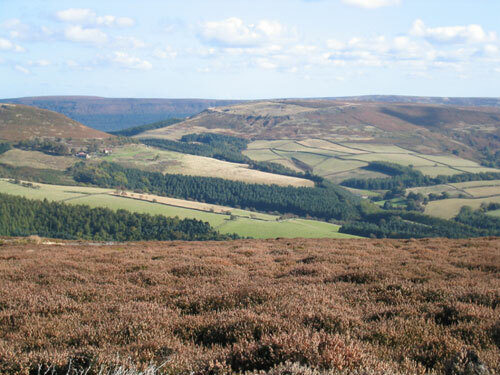 The Yorkshire Moors are, to me, fascinating landscapes. I know that many find them bleak and dreary, especially in early spring before the greening begins, but I like them. They have a character about them appeals to me. I did not take pictures, because most of the time we were in a moving car. The picture above is from a different season of the year. 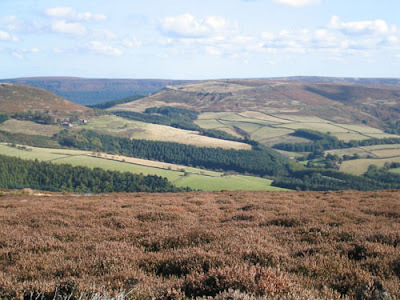 I could not find a picture that I could upload for the early spring season, but here's a link to a photo of what the Moors looked like during my visit. Another near miss of a misadventure happened in the car. MP asked me to roll down the car window in the back a little for the collies to get air. I looked for the button to press, but MP told me that I had to wind the window down. Ooooh. By accident I grasped the door handle, and Mrs MP abruptly stopped the car and quietly said, "Close the car door, please." All we needed was for me to fall out of the car in the middle of the moors. If I could read thoughts, what would I see? "When can we unload this old bird?" We arrived at Rievaulx Abbey. Oh my! What a beautiful place. Mrs MP and I toured the Abbey while MP exercised the collies. What a holy place. 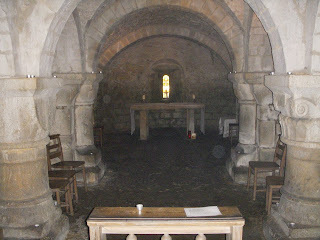 I could sense the presence of many saints from the past who prayed there, and the prayers seemed to linger in the abbey. I thought of our blog friend Prior Aelred of St. Gregory's Abbey, because his namesake was abbot of Rievaulx Abbey. We stopped for lunch at The Blacksmiths Arms in Lastingham, and I made the grand gesture of treating MP and Mrs MP to a quite inexpensive, but tasty lunch. Across from from the pub was the Church of St. Mary, which MP and I visited, while Mrs MP loaded the dogs into the car. Below is my view of the interior of the beautiful old church. Then it was time for my train back to Leeds. I had an invitation to Doorman-Priest's Philharmonic Choral Society's concert that evening. Altogether a lovely day for which I'm quite grateful to MP and Mrs MP. What a great adventure. Near misses only engrave them more deeply into the soul. Glad you had such good company. 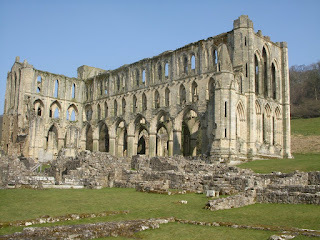 The photos of Rievaulx and St, Mary's church make me long for a trip away. I'm glad it was a success, but of course we all want to know ifyou and Jonathan "hit it off" or sniped at each other, and all the other details that result from a Real Life collision with mental pictures set up via epistolary communication. IT, at the risk of ruining his reputation for irascibility, I can only say that MP was lovely to me. No clashes. I was on my best behavior, too. On my end, it seemed like we hit it off, but he'll have to give his view - or not. Thanks for the tale of this day -- enjoying it all vicariously --- and remembering our day on Mull and Iona with them. Mimi, thanks for your wonderful accounts of your adventures on this trip. I think all of us were there with you in spirit and wished we were there in person. I'm so glad you made it back safely. Sounds like it was a wonderful adventure! I just love that part of England - so beautiful! The trip had a magical air about it, despite the mishaps. I had a lovely time, and I will never forget it, nor will I forget the beautiful people I met while I was there. I met the border collies, Callum, Glenna, and Delphi. Delphi is MP's dog, and she seemed not to like me. Glenna is a silky beauty and was quite friendly. Glad you survived, Mimi: the UK, the UK rail system, MP, the works! JCF, Glenna is beautiful, and she knows it. She's a prima donna and wants all the attention. Maybe she's anti-social with other dogs, because she wants all the interaction with the humans. Welcome back Mimi! I am glad that inspite of the mishaps you had a wonderful time and even had your purse back before leaving. Thanks for the wonderful stories and much appreciation to those who held the fort in your absence. How is the jet lag? Did you see this sculpture in Liverpool? I slept pretty well the first night, because I was exhausted, but I didn't sleep much last night. Ann, I didn't go to Liverpool. It's a lovely sculpture. Wow - almost a missed connection! It is great that you got to get together with the MP's. It sounds like a brilliant day - people, places and of course those dogs. I would so love to visit the Moors. And the Abbey- amazing. Thanks for writing such a compelling post about this part of your journey. Quite a few near misses, dear Fran. In so many ways, the trip was amazing. It was as though I was caught up in something beyond my control. Grandmere--welcome home! And it is good to hear of the journey. I bet you would not get the window button and the door latch confused in my car, should you come to visit.... but of course, the Moors must have been hypnotizing, and there is probably nothing as majestic in Virginia. So glad you had a good trip, and I'm still very envious. Someday! Margaret, I'm not sure. I do some dumb things. Hypnotizing is a good description for what I felt in the Moors. Thanks for the words of welcome. KJ, I hope that you get to go soon. The last time I crossed the ocean was 10 years ago. There's a vast difference between 64 and 74. Go while you're still an eager puppy. This is fun. I'm glad you enjoyed your trip. It's good to see places through other's eyes. Everyone sees things differently. Thanks for the travel log. Glad that it all worked out -- now you have to come to Wyoming and see our prairies and mountains. It appears that for the next few days, I'll be writing a diary of the highlights of my trip. I'm taking the days in sequence, because doing it that way is a memory aid, and I'll have a record of my trip. Ann, I've been to Wyoming. We had a memorable family vacation in the Tetons when our children were middle school age, but I'd love to go again. I'm afraid that I could not do today the hiking that we did back then. We have a car - would not make you hike or ride a horse. LOL. We have all the modern conveniences now!! MP didn't ask about the Post office because he's a man, and we don't ask. We prefer to let our hunter/gatherer insticts rule and search for it ourselves. You should see me wandering up and down the aisles in the supermarket looking for that elusive bottle of sauce or the stuffed red peppers! You never pay attention, do you, woman? Glenna is my dog and, therefore, antisocial but loyal. Delphi is Mrs MadPriest's dog and is, therefore, just like a woman. Saintly Ramblings speaks the truth. He is a true English gentleman. SR, of course, I know it was the prideful man thing that kept MP from asking, but I didn't like the idea spending half the day wandering around the village looking for the PO. Someone had to do something. MadPriest, I see that you are back in character. I suppose that you can do nice only for limited periods. So many dogs, so many names.... Credit due. I had Callum right. It is such a gift to feel lingering prayers. A holy thing. Being Peace, it is a gift. It is. a propos "Lingering prayers" - now you know why I like my present post with 11 ancient churches that have stood in the countryside for near on 1,000 years. With SR standing beside them for near on the same. SR, I understand perfectly. I just wonder how you keep 11 churches straight in your head. I'd be calling St Mary's Holy Trinity, etc., and I'd probably show up at the wrong church on the occasional Sunday. DP, give me a chance! I'm getting to it, but I want to do it nicely. I've started writing, but I want to get it right. I am about to go on grandmother duty now, but the concert post is next on the agenda. I promise. Maybe after a few filler jokes. I think the winter moors are lovely, and I'm so glad you got to go to Rievaulx! (A "thin place," I'll bet.) One of these years, I'm going to go back to the UK. Sooner than later, I hope. PJ, I called him Jonathan. Rievaulx is indeed one of the thin places. Dinner with DP? I all but moved in with him and his family. They were lovely. You visited kitty Aelred's place!!!!! Caminante, yes! Kitty Aelred's place, too. It's so beautiful. I have been sick and have gotten very behind. so glad you got to do this. It sounds delightful. Diane! I went to your blog and read about your illness. I am so sorry. As I said over there, I offer prayers for you and your husband for a speedy return to full health and strength. My trip was delightful, even with the misadventures. The thing I want to know is, w/ his Northern accent, was MP intelligible? Could you understand a word he said? The thing I want to know, MP, was Mimi intelligible? Could you understand a word she said? I don't have a northern accent. I have lived in so many regions of England that I have a full range of colloquialisms and accents. However, in public, I speak the Queen's English so that the hoi poloi can understand me. All non-Americans can understand any American accent having lived with them all in film and on TV all their lives. It's only the lazy Americans who have to have British, New Zealand and Australian film dubbed so they can understand them. JCF, what MP says is true. Hearing him speak, you could not distinguish him from a member of the royal family. You notice that he didn't say what he thought of my accent. Mine is New Orleans, with a trace of Cajun mixed in after living in Thibodaux for 40 years.